Imagine standing in your kitchen and hearing, “You are to write a book. It is called ‘Dream the Answer’. There was no one in the room with me. The year was 2001. This was clearly a clairaudient experience (inner hearing) and my reaction was one of excitement and surprise. My first thought was – What a great title! 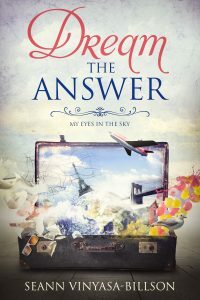 This is a bunch of stories mixed in with a “How To” for working with your dreams for finding answers. Since I do bounce around a bit in this little book of mine, I wanted to say a couple of things first that will help you understand the stories a bit better. First off, when I say that my daughter and I ‘did this or that’ and no one else seems to be around, that is because it was just the two of us for 12 years. Except for when we lived with my parents initially until she was eight months old and again with my younger brother for a year or two. My intention with sharing my stories and what I have learned is to pass this on for others to learn from. It is also a diary of sorts for my children to read and understand their mother better. (I hope) I have learned from so many people and my favourite books are memoirs, biographies and autobiographies. I love to learn from other peoples stories so it makes sense to share mine too. Plus as an added bonus, readers can learn to work with their dreams for themselves, just like I did. The most perplexing premonition and memorable event involved dreaming of my maternal grandfather. My dream took place in the beginning of March 1998 and I recognize this now as astral travelling in my dream state. Suddenly, I found myself suspended in space and my grandpa appeared in front of me. I awoke from this dream feeling sick to my stomach. I hoped that it had been just a nightmare. It was something I couldn’t keep to myself so I phoned my mother’s oldest brother to tell him as he is a psychic also. He agreed with me that it was probably just a nightmare. As March drew to an end that year, my uncle announced he was coming to Manitoba soon to see his father. It would be a 10 to 12 hour drive. Immediately I felt anxious as the date he said he was arriving on coincided with my astral travel experience. Sure enough, my uncle arrived for a visit on April. 8th, 1998. Grandpa had already taken a turn for the worst and could no longer communicate with anyone. He could only move his foot to the Celtic music we played in his nursing home room. I informed my older brother Chad about my dream as he planned to go see grandpa on the 11th. If my dream was true and it sure was shaping up that way, grandpa wouldn’t be in his body on the 11th, only in spirit. Suppose it was my passion about the whole thing that persuaded him and we went together to say goodbye. At 10:05 pm, two days after my uncle’s arrival, on April. 10th, I whispered to my Grandpa to come and see me in my dreams and that it was okay for him to go. As I kissed him goodbye, he tried to answer me with a muffled sound and nodded his head. I found out later that he passed away ten minutes after Chad and I left the room. Looking back on the similarities of what the dreams felt like and what I felt like when I woke up finally led me to knowing how to recognize a premonition. It was after this awakening that I could then understand and teach others what to look for. If what grandpa said was true of us ‘choosing’ then I take that to mean I chose my parents and siblings as well. Other people have spoken of this. For example: Dr. Wayne Dyer spoke of us choosing our parents before we are born. This past weekend, I had the pleasure of meeting Gail Thackray and she said the same thing. This is my experience and I have to interpret it the best I can. It applies to this situation as I cannot speak for others. It may not explain murders or accidents (unless that is a prior agreement between the two souls). I am of the opinion that people can be accidentally taken out or leave before their time. But again, I really do not know. Recently, I spoke of this experience on my podcast on my site – If you knew…what does that mean? My Grandpa did come see me in my dreams and this was one thing he told me – Write it down! In 2005, my dream had me visiting the farm where my maternal grandparents lived. I was standing where my grandfather sat at the table which was in front of the stove. Knowing with all my heart that he was sitting there, I demanded he appear to me so I could see him. Frustrating feelings erupted inside of me because I knew without a doubt that he was there. I could feel his presence. The more I insisted he appear and he didn’t, the more upset I became and the more he did not make himself observable to me. Giving up, I turned to leave. It was in that moment of releasing the need to see him, that my grandpa became visible. He looked at me with his usual sparkling eyes and conniving grin. There he was. Finally!!! I was seeing my grandpa again and a sense of relief came over me and at the same time an overriding feeling of joy. He told me that if I am pushing for something, it does not allow for the energy to flow. If I keep pushing and demanding to see or know something, it creates a blockage. The moment I stepped back after stating what I wanted clearly, then he came to me.